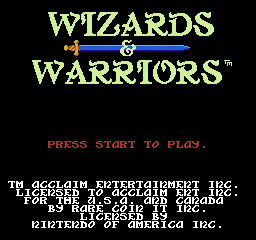 Wizards & Warriors (Rare Ltd., 1987) - NewRetroWave - Stay Retro! | Live The 80's Dream! The classic story recurs throughout mythology, folklore, legends, and even more modern tales: the brave champion defeats the evil wizard and rescues the princess. Hell, even Super Mario Brothers follows the theme loosely! Along the way, the hero battles baddies, finds goodies, and maybe even learns some kind of moral lesson. Or not. 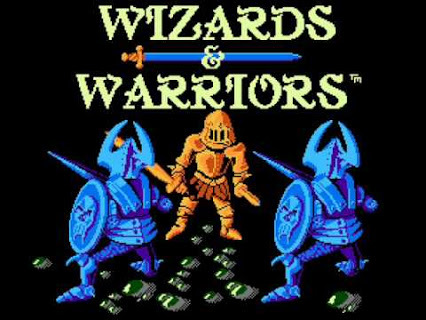 Released in 1987 by the British software firm Rare, Ltd., Wizards & Warriors fits into that mould neatly. 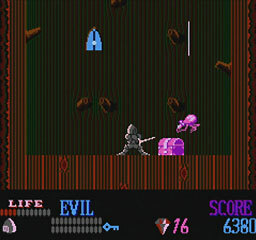 It was another of my formative experiences with console games; it and its sequel, IronSword, were among the first cluster of NES titles I acquired. The original, however, is the one I’ll be focusing on today. 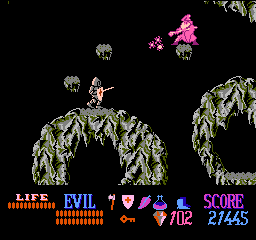 The follow-up to Rare’s first NES title, Slalom, Wizards & Warriors chronicles the struggle of the brave knight Kuros against the wizard Malkil. You see, Malkil has pulled a typical “evil wizard” move: he’s kidnapped the poor princess. He’s absconded to his tower deep in the forest with her, and Kuros has to go the long way round to reach them. 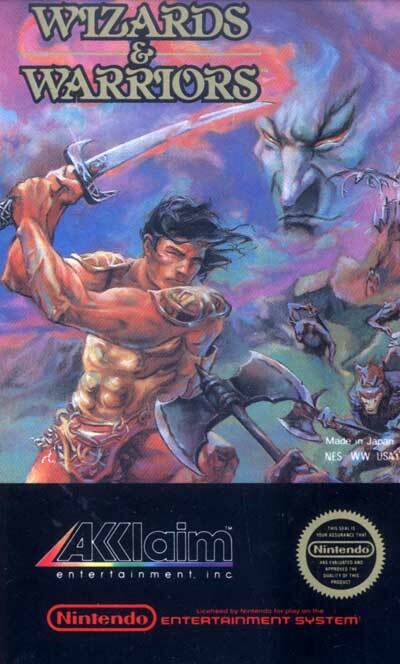 Kuros eschews his armor and dresses a bit more casually for the box art. Wizards & Warriors got stellar reviews when it was released, but I’ll be up front with you: this game can be hard to love. Kuros has all the agility and poise of a wet gym sock, and his feet/head are more effective at dispatching enemies than his sword is sometimes. Thankfully, if you poke around a bit, you can find things like wands and daggers that increase your lethality in combat. The dagger is indispensable, as it behaves like a boomerang and obviates your need to get super close to anything. Later, you can swap this out for a more damaging axe. You can also find other magical items, like a feather that makes you fall more slowly, a shield that helps reduce the damage you take, and specific items you’ll need to more easily handle the bosses. If you get hurt (which you definitely will), there’s food lying around like in so many of these games. I’m not even going to attempt to quantify or classify the enemies in this game. The variety is staggering. While some of them may look stupid, all of the monsters can hurt you pretty badly if you’re not careful. The first level is particularly insulting, as bird after bird assaults you simply for being there. As you progress, things get more appropriate, featuring the typical fantasy goblins, gargoyles and spooks. The difficulty curve is insane, but once you get the hang of how you’re supposed to play, the challenge scales well. As you progress underground and then up to the tower, both the terrain and the horde of baddies get gradually harder to cope with. The tower gets especially hectic, with a bunch of things that are halfway between monster and trap barring your way. 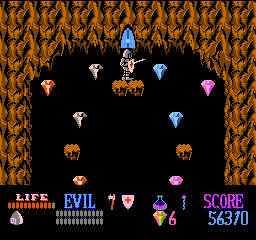 A lot of the bosses behave in a similar fashion to one another, with a few differences or improvements in strategy. Basically, if you can “follow the bouncing ball” during a sing-along, you can defeat the bosses in this game. 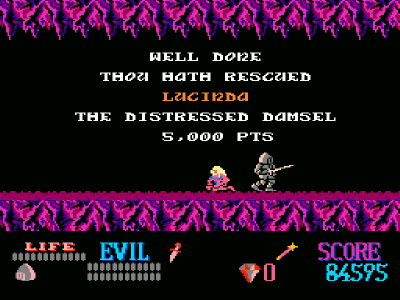 After each boss, Kuros finds a maiden bound to the ceiling and cuts her down. He then just sort of walks off, something I’ve always found kind of funny. 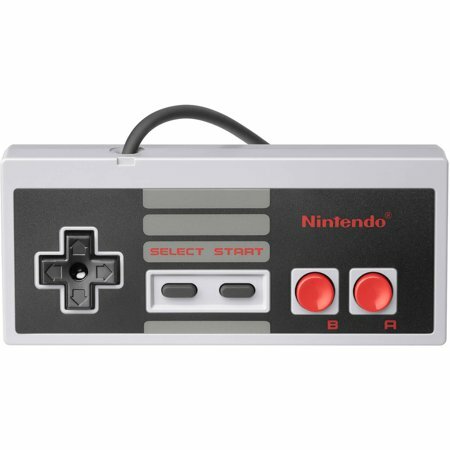 None of the graphics are terribly complicated, but you can’t count that against Wizards & Warriors too badly; no NES graphics were too spectacular just yet. I mentioned some of the enemies looking goofy as hell, and they certainly do, but you can at least tell what they’re supposed to be. Where the visuals slack off, the sound picks up; the music is minimalist at times, but will stick in your head. 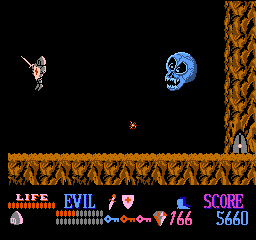 The sound effects are standard for an NES game in 1987, but they’re bright and purposeful without being annoying. As much as I’ve talked this game down, it’s a pretty significant title in terms of historical value. The gaming publications of the time gave it favorable reviews, and I won’t pretend there’s nothing good about it; Wizards & Warriors can seem at first like an overly-saturated crapfest, but hiding in there is a solid, challenging game that requires a little problem-solving on top of a good virtual sword-arm. Tune in next time, RetroManiacs!